Surfing on the West Coast of North America goes way back in time. Nowadays everyone on this stretch of coastline seems to be a surfer, or at least know a few. For those of us who are out surfing everyday, we know the thrill that comes from it and the sport really becomes a significant part of our lives. It can make us want to share what we love with others, but at the same time want to keep it to ourselves so the crowds stay down. Sometimes I think surfers are torn over what to do. But seeing as we aren’t in the dark anymore, and people are going to find out and want to learn to surf even if we don’t take them out ourselves, here is The Surfing Blog’s Top Ten Places to Learn to Surf on The West Coast. San Onofre, just south of the world famous Lower Trestles, could be the best place to learn to surf on the whole West Coast. It’s comparable to Waikiki in Hawaii. Each day of the year there are hundreds of longboarders out on the slow and crumbly waves offered at San Onofre State Beach. The bottom is made up of cobblestones just like its neighbor, Trestles, but the waves break much differently, making it a perfect place to learn. The crowd is usually friendly, and you will see multiple surfers dropping in on every wave, riding into shore together. 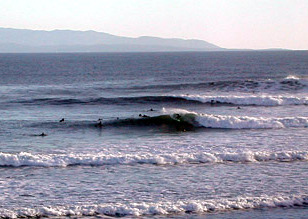 Bolinas offers several spots to surf, the two main ones being The Patch and The Jetty. 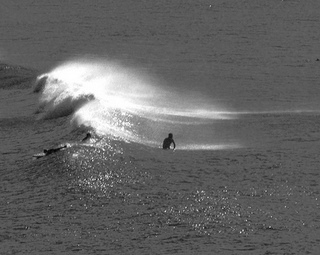 The Patch breaks on Duxbury Reef creating slow moving longboard waves. It is a great spot to learn to surf, one of the best in the region. It’s usually crowded with other longboarders and beginners going out for the first time. 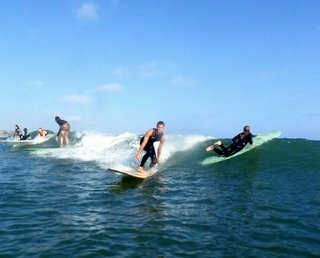 It’s also one of the most popular spots to take surf lessons in Northern California. Surfing is possibly more popular in Santa Cruz than anywhere else on the West Coast. If you are going to be in Santa Cruz then you have to take a shot at surfing, and Cowells it the place to do it. Cowells is a slow-rolling right point-break that breaks over a sand bottom. It can be very crowded with beginners, which is what you want when you are learning for the first time. The paddle out is easy, and of course, lessons are readily available from local surf shops in the area. 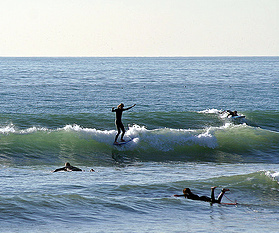 The beaches in Santa Monica are known for their slow moving beginner waves. The slightly sloping sandy bottoms create crumbly longboard waves that are great to learn to surf on. This also might be one of the easiest places around to find surf lessons. Then once you start getting the hang of it, Malibu is right up the road, a great spot to paddle out with your newly developed surfing skills. Doheny is the only break left in an area that once was home to Killer Dana, a famous high performance right-hand point break. The Dana Point Harbor was built and the jetties and breakwaters destroyed the wave. Now it is a super mushy wave that is frequented by longboarders and people who are going to learn to surf for the first time. You wont get into any trouble here for dropping in on the same wave as others or looking like you have no idea what you are doing. The whole La Jolla area is full of mellow sand and reef breaks that are great for longboarding most of the year. There are a ton of surf camps and surf lessons available along this stretch of coast, making it one of the best places to go for a vacation with the intent to learn to surf. One of the few parts of the coastline in Oregon that isn’t covered in sharp rocks, this area offers a huge, well-protected beach, where probably every surfer in Oregon has learned to surf. It is known locally as the “Waikiki of Oregon”, although the water temperatures are not nearly the same as in Hawaii, so pack your wetsuits, booties, and gloves. Basically anywhere north of the pier in Huntington is a good place to learn to surf. Unless there is a really big swell, the waves here cater to beginners. And what better place is there to learn to surf than Surf City, USA? Mondos is visible from the road on route 101, and is a perfect spot for beginners because of where it’s located. Most big swells are blocked by Santa Cruz Island so it never gets too crazy there. If you stick to the inside, then you’ll feel right at home with all the other beginners, and be up on your feet in no time. This surf spot is on the south end of Chesterman Beach on the west coast of Vancouver Island. The large swells that are common in this area are blocked by Frank Island, making for a perfect area for beginners to go tackle waves for their first time. Remember you’re in Canada now, so no matter what time of year you are here, it is going to be cold! The way this list is ordered can definitely be argued, and there could even be some surf spots that deserve to be on here that are not. If you have a surf spot on the West Coast that you think is the best to learn to surf at, leave your comments below so our readers can have even more options.